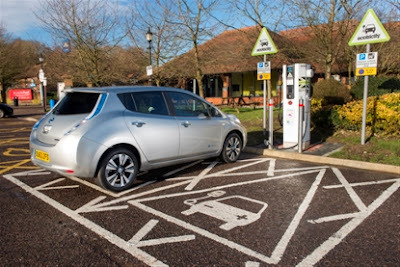 Nissan has announced 1,000 CHAdeMO quick chargers have now been installed in Europe with the commissioning of the charger at the Roadchef Clacket Lane Services in Surrey, UK. The fast charging unit can recharge the batteries of compatible* electric vehicles- including the 100% electric Nissan LEAF- from zero to 80 percent charge in just 30 minutes, and at zero cost. Director of Electric Vehicles, Nissan Europe, Jean Pierre Diernaz commented: "This is a huge landmark for zero-emission mobility, allowing a range of EVs, including the Nissan LEAF and forthcoming Nissan e-NV200 electric van, to quickly extend their journeys. The UK charging network is expanding rapidly and through our partner Ecotricity, customers are able to "refuel" their car for free with wind and solar generated electricity." The rate of installation of CHAdeMO quick chargers across Europe rose sharply in 2013, hugely increasing access for Nissan LEAF customers. In 2010 there were just 16 quick charging points. This rose to 155 a year later and 540 in 2012. The 1,000 mark in 2013 will be dwarfed by the end of 2014 with over 1,800 quick charger points expected. Together with Nissan, investment in this Euope-wide development of infrastructure comes from a multitude of partners in the energy field, including the Swiss multinational power company ABB, French quick charger manufacturers DBT, and the Portuguese EFACEC Corporation, leaders in the electromechanics field.